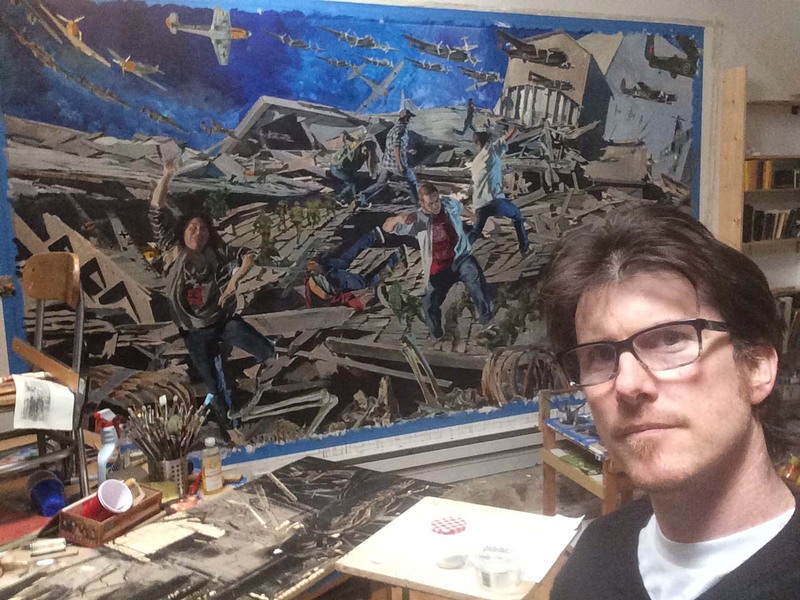 Nathan Lewis, whose work is now on view in a solo exhibition in Stamford, Connecticut, is a painter with a strong feeling for the cycles of history, but no desire to reach back towards a "Golden Age." Lewis finds more than enough subjects in the world that surrounds him right now and he paints abandoned factory sites with the same vigor and pathos that Piranesi brought to this views of ruined Greco-Roman temples. In the view of his dealer, Fernando Luis Alvarez, Lewis is endowed with an intense sense of intellectual curiosity that "prevents his work from becoming stale." 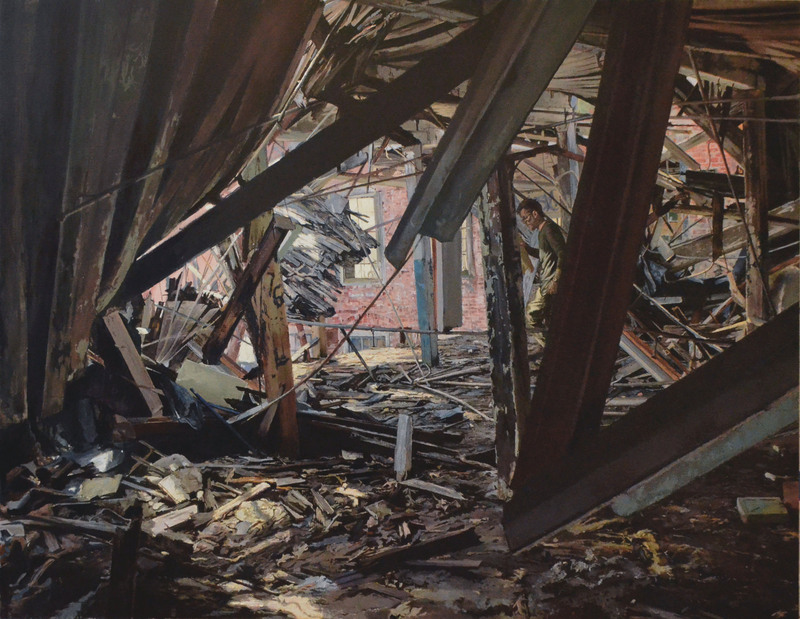 Alvarez sees Lewis as an artist whose work "vibrates with electricity and is masterfully painted; soaked in multitudes of historical, literary, philosophical and cultural references..."
I recently interviewed Nathan Lewis to ask him more about his background and the ideas behind his recent work. Nathan Lewis JS: Tell me about your early life. Were you always creative and artistic? NL: I certainly liked to draw, but I didn't think of myself as creative until I started acting on it enough to realize that perhaps I was creative. I came out of the skating/bmx culture of the late 1980's. I had created a 'zine about bmx and youth culture in Northern California. The 'zine led me to photography, and photography led me towards art. At about 20 years old, I had taken a few art classes, and the idea that art was a potential way to make sense of the world absorbed me. I got very serious about it, and it grounded me in a way nothing else was able to. 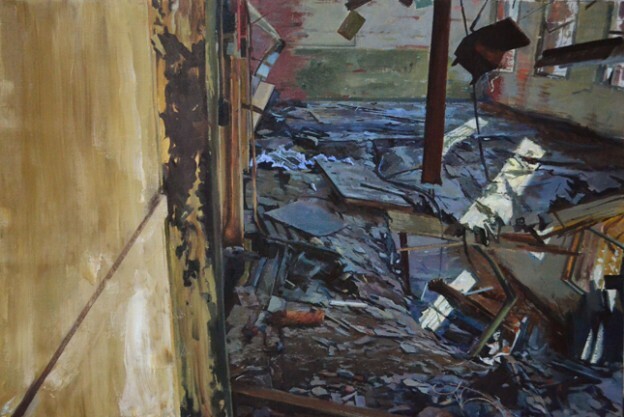 Division Collapse, Oil on canvas, 24" x 36", 2014 JS: Nathan you have studied painting both in the US and in Europe. Tell me a bit about your studies and how they shaped you and your art. NL: My relationship with academia was a tenuous one. I was in and out of school a lot and took eleven years to get an undergraduate degree. I went to Sacramento City College for about 8 years on and off, just taking classes that interested me. I moved to St. Petersburg, Russia for six months in 1993. I had no formal training there, but I lived about three blocks from the Hermitage, and would draw regularly from the Rembrandt and Rubens paintings. I spent more time in that museum than I had in any classroom and I really started to detect the eccentricities of different artists' work. I didn't know who Ribera was before I was in St. Petersburg, but I was so excited by the paintings of his, I thought I had discovered a great unknown artist. Of course as I went to more and more museums, I would come to realize that they also had work by Ribera. The paintings in the Hermitage held a secret and spoke a language that I felt connected to but did not understand fully. The time in front of those works was the beginning of a lifelong pursuit of looking at paintings in museums and galleries, learning and deciphering the language. At the tail end of my time in Russia, I went to Krakow, in Poland to see Leonardo's Lady with an Ermine, and hitchhiked to Germany, to visit the Alte Pinakothek in Munich and the Gemaldegalerie in Berlin. The time in museums, the books I was reading, the music I listened to all shaped my work. I consider these integral parts of my education, much of which happened outside of school. in 1995, I studied in Italy at the Florence Academy of Art for a semester. It wasn't a great fit for me, but being in Italy was a dream. I skipped school a lot and would go to the churches and the drawing-room of the Uffizi to be with the works that spoke to me. When I moved back to the states, I painted a lot, but over time felt I still needed some form of instruction. I went to Lyme Academy College in CT, which had a component of academic instruction, but a larger faculty with broader scope than the FAA and a great art historian, Joy Pepe, whom I married ten years later. I got my BFA there, took a year off, and then went to SMFA, Boston and Tufts University, receiving my MFA in 2004. SMFA was very different from the other schools I attended, and it was a welcomed change to be thrown in with artists working in the full gamut of media explored today. As far as the people in formal schooling that had the greatest influence on my work, Fred Dalkey at SCC and Joy Pepe at LACFA. In Fred, I saw that it was possible to be connected intimately to this vast history of art, even in work that is contemporary in nature. Through Joy I came to realize that art was much bigger than its maker. She challenged me intellectually and gave me insight into the complexity of how art can be interpreted, and how it has functioned in culture. This excited me to think that we, as artists, are playing with images and juxtapositions of which we may not gather the full meaning. It gave me a larger sense of what art could be. Orange Was the Sky, Oil on canvas, 72" x 66", 2010 JS: What did your art look like a decade ago? NL: My work in 2005 was a bit more graphic (visually). I was using more appropriated imagery and experimenting heavily with masking and varied methods of applying paint- pouring, staining, spraying, swiping. It was a little more like printmaking. My work fluctuates between naturalism and a constructed, designed, collage influenced presentation. I have also done some installations and am currently starting some large format woodcuts. Painting is my primary practice, but there are occasional offshoots. 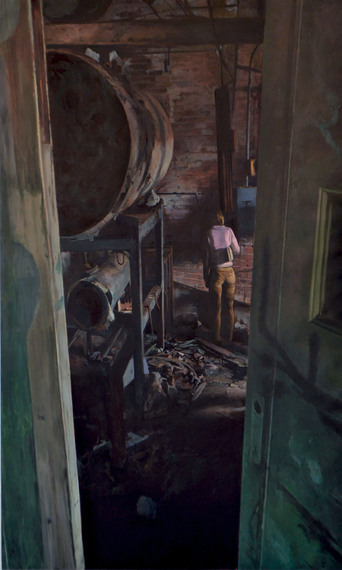 Octaves, Oil on canvas, 24" x 24", 2014 JS: How and when did you begin painting abandoned factories? NL: I've always loved exploring abandoned spaces. 2011 is when I first decided to paint them. I've always been more of a figure painter and object (form) oriented. The factories were a departure from that mode of thinking and more related to settings. Although figures are in most of the paintings, the architecture and composition play a larger role in the psychology of the piece. Some of these spaces that are collapsing provided an experience of light that was uncommon and made me contemplate anew the strangeness and beauty of light. I think that is what prompted me to the series of works. The unfamiliar forms provided the challenge of inventing new personal translations of what I saw and felt into the formal language of painting. The factories themselves are ruins of an industriousness that is foreign to us today. Gate Keeper, Oil on canvas, 72" x 48", 2013 JS: Is it fair to say that nostalgia, transformation and loss are some of your recurring themes? NL: If I tried to pinpoint recurring themes, I think mortality, desire, and history are what guide the work most. I'm particularly interested in doorways or moments between worlds or realities. The subject within the painting, myself, or the viewer is often in a position to choose between, or at least to come up against two, often conflicting, fields. These could be the history and the present, the abject in light of the mythic, the tension between ethics and desire, or absurdity and humor amidst grave realities. Of the terms you mentioned, transformation is the one to which I feel the most connected; particularly the occurrences that can change us or reveal our distinctions or make us understand what our hidden motivations are. Loss can certainly be a part of change, and I tend to think we as humans gain more from failure and the things in the world that pose the greatest threat to us. Failure and loss help us understand and question our desires. It can breed doubt, which I see as difficult, but ultimately very healthy, if one can still hold on to their desires or a sense of purpose. Nostalgia is a little trickier. As much as I study and admire the history of the arts, I'm really not interested in living in the past or idealizing it. I see nostalgia as a symptom of being human. It is easier to idealize something that is safely established in the past than it is to work with the difficulties and uncertainties of the present. This is what I see as the main problem with the atelier system and the Classical Realist movement in art we see today. I have no desire to go back to a golden age. When I rely on historic modes of depictions or formal languages associated with a certain time period, I'm often doing it to shed light on the time we live in and how it is different from the time I am referencing. Other times I'm trying to get at the nature of humans and dissect the need for nostalgia or complicate its purpose. NL: Till We Find the Blessed Isles Where Our Friends Are Dwelling is a contemporary re-imagining of Washington Crossing the Delaware, by Emmanuel Leutze. Looking at the original painting in the Metropolitan Museum of Art, I contemplated what the difference was between America at the very beginning and America now. Leutze's painting is one of the first depictions of what we associate as the American Dream, a quest for independence and freedom, and the willingness to partake in the struggle to achieve it. The painting is an icon of the American Spirit. Using the framework of the original painting as a starting point, I reference the painting directly, using some of the same poses of the figures. The differences between the paintings become a 230 year dialogue of a nation continually struggling for their independence. Till We Find the Blessed Isles Where Our Friends Are Dwelling gets its title from a line in Friedrich Nietzsche's Thus Spoke Zarathustra. The Blessed Isles, also called the Elysian Fields, is a Greek concept of where the virtuous go to rest at the end of their lives. Tying this in with the idea of the quest of the American Dream, I depicted the boat battling seemingly insurmountable swells towards a promised land. The youth in the boat strive towards a future they have yet to achieve. The diversity of race and gender gives a more contemporary view of the America we see today. The models for the painting were specific college students becoming adults through education and struggling towards their own unique futures. This is hinted at through the Asian American female seen twice in the painting. 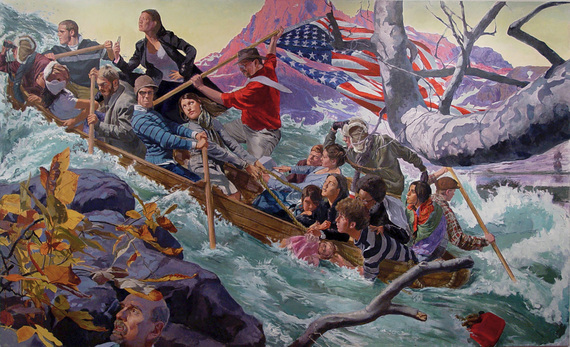 Near the back of the painting, she is seen holding a doll-like a child, yet at the front of the painting she stands in Washington's position confidently leading the group over the treacherous waters. In George Washington Crossing the Delaware the boatmen row their way towards a chance at a new future and the chance of a nation built of independence and freedom. Till We Find the Blessed Isles Where Our Friends Are Dwelling shows a diverse, multicultural America, already a nation, already free, already successful, yet struggling with the sustainability of a lifestyle still dependent on foreign resources. Clues to this in the painting are the emergency gas can dragging behind the boat and the tiny oil derrick the standing figure grasps. 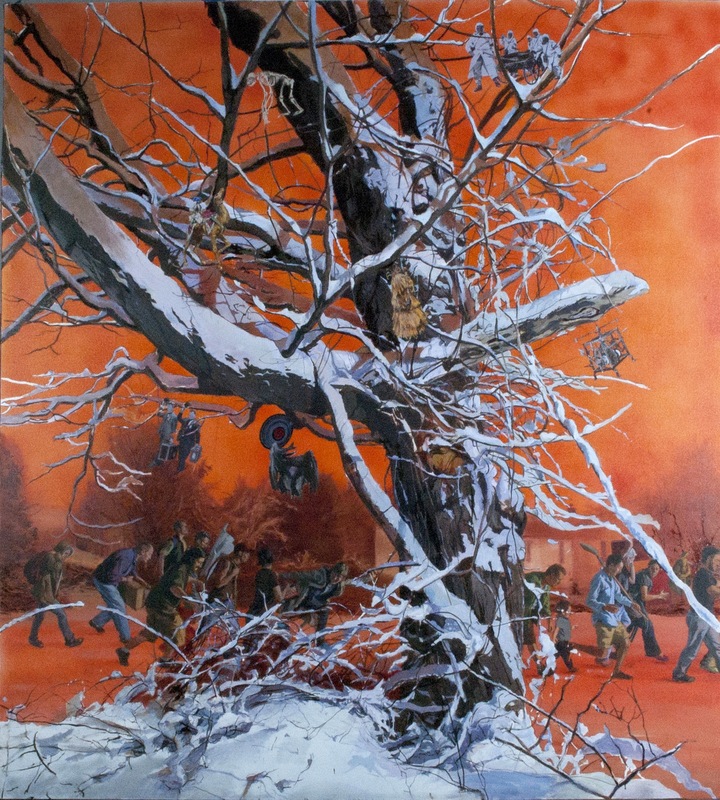 In both paintings the American Dream is revealed as a continual fight for independence. The text on the sides of Till We Find the Blessed Isles Where Our Friends Are Dwelling quotes the Declaration of Independence, which in essence is a text that speaks to the tension between the individuals that make up a culture and the government that is meant to serve them. JS: Do you favor comedy or tragedy in your work? NL: I use both in my work. Tragedy is perhaps the more apparent, but I do feel a special connection to comedians. They so often see society from a position on the peripheries of it, and they point to sore spots and taboos of our cultures in ways that only the persecuted could. Comedians regularly come out of tragic lives, but they use humor as a way to triumph over the ills of living. And if they don't triumph, they at least put up the good fight. 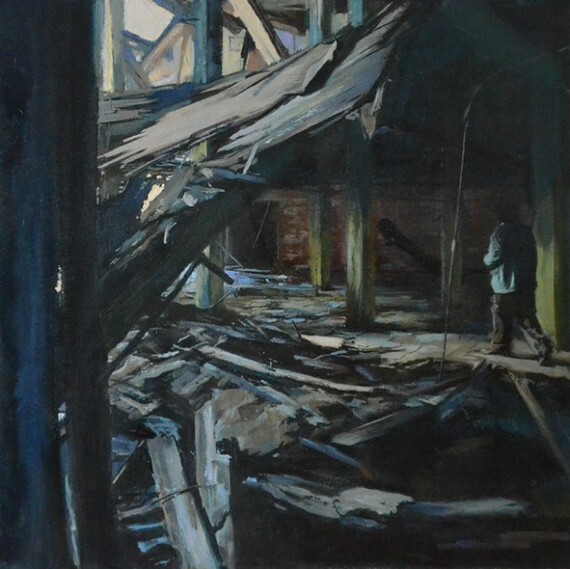 I do get questioned a lot for making paintings that are dark or seemingly pessimistic. As someone who came into the world not feeling ready for it, I sometimes use painting to explore and point to the dilemmas I face and others will face living in the world. Focusing on the dilemmas gives me time to question my fears or at least to recognize them in a realm where I have a higher degree of interaction and say. I'm not sure this is tragedy, more than it is coming to terms with things that may threaten the parts of humanity I value most. Some of the artists and writers that have been the greatest help to me have seemingly dark or absurdist views on life. Kafka, Dostoyevsky, Calvino, Nietzsche, Bach, Goya, Rembrandt, Kollwitz, Blake, and Beckett. I see in them, their works, and their characters, an intense will to hold onto their humanity in spite of the multitude of things that threaten it. Their inclusion of the darker side of human nature gives integrity to their art in that their humanity has to survive and play out in an uncertain world that is not unlike our own. Along these lines, I think my exploration of darker subjects is more than anything else trying to ensure that art is not simply about beauty and aesthetics. That it is not merely a pretty thing to admire, but a reflection on the full complexity of what it is to live. Light is the Lion that Comes Down to Drink, Oil on canvas, 48" x 67", 2012 JS: Who are your most important influences? NL: Anything that tries to get at the core of what we might be doing here. I love to see people suddenly finding a voice and say in the world. JS: Is there anything else you would like to mention? NL: Fernando Luis Alvarez Gallery will be having a lecture and panel discussion in the very near future on the painting Till We Find the Blessed Isles Where Our Friends Are Dwelling. The Panelists will include curators, politicians, myself and Fernando. I have a couple of museum shows coming up. One is in Summer 2015 called Remythologies: New Inventions of Old Stories, curated by Stephen Kobasa at the Housatonic Museum in CT. The other is a solo show in Fall 2015 at Oglethorpe University Museum of Art in Atlanta, GA, curated by Elizabeth Peterson.